I just wish we were further along the curve. Having to wait so long for "takeoff" is aggravating. 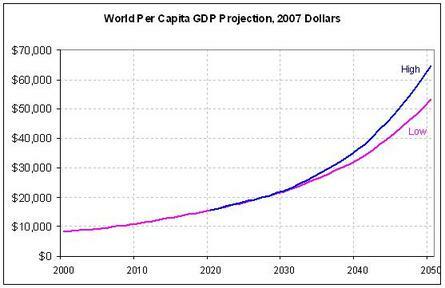 BTW, I just notices a typo on the "intervals that it takes for per-capita World GDP to double." The forth line says: "1980 to 1915 : 35 years" instead of "1880..."
Other than that, it's a fine post. Doom and gloom does happen once and a while. History is littered with it: the Dark Ages, 100 year wars, end of civilizations, switching of the magnetic poles and depressions. You can deny all you want. The last empire to claim that the march of history would lead to paradise was the communist USSR. And after each disaster you mention, the economic growth has gotten right back to the trendline. The data supports that, without exception. Even the Great Depression was erased by a return to the trendline. The dot-com bubble also exhibited the same. It is you who are in denial that the economy always returns to the trendline. Dark Ages lasted a long time. End of civilizations last a long time. Global warming may last a long time. If a diaster happens (and one always comes along eventually), then the economy always returns to the trendline may take a long time. 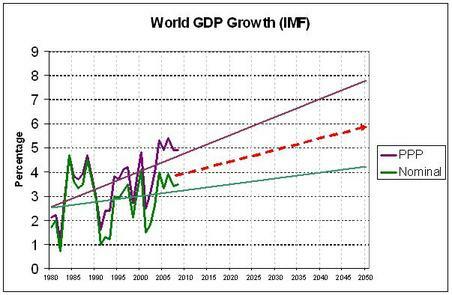 In the last 150 years, no world event caused World GDP growth to be below the trendline for more than 6 years. The Great Depression, WW2, Dot-Com bubble, 1970s, etc. None were below the trendline more than 6 years. No year since 1973 has had negative GDP growth. Very few have had even under 2% GDP growth, due to that being too many standard deviations from the mean. A typical major slowdown today would comprise of 2-3 years of 1% growth, but is still growth. It would be followed by 2-3 years of 6%+ growth just to catch up to the trendline (think about dot-com bust and the subsequent 2003-present bull market). Consider standard deviations and how often there is a statistical chance of being 1, 2, or 3 standard deviations from the mean. The Futurist : Good post. BTW, don't accept that trash-talk about the so-called Dark Ages. I used to buy into that as well, but historical research reveals that the collapse (admittedly not pretty) of the classical world is what led to our modern world -- a gradual revolution that took over 1000 years to unfold. Q1) What is the probability that a given year will have negative GDP growth? Q2) What is the probability of a 10-year stretch of negative GDP growth? Every generation has its naysayers predicting the end of human civlization due to lack of resources, climate change, end of the world type wars but the facts are we are great at sticking around and in the last century we have gotten amazing at it. Conflict and hardship only makes us tougher and better at doing our thing. Go human genius! Here in California, there is a huge earthquake on average every 300 years. We are in the window now. You would be very surprised how few have earthquake insurance. The mispreception is that we have not had one of those for the last hundred years so they must be a thing of the past. You remind me of these, everything will be fine, I don't need stinking insurance idiots. The Japaneese built their biggest nuclear power plant new an earthquake fault and today an earthquake has leaked radioactive water, idiots. One has nothing to do with another. Plus, even an Earthquake would not slow GDP growth in California (let alone the world) for more than 1 year. The Tsunami in Asia did not slow GDP growth of Indonesia, Thailand, Malaysia, etc. You did not answer my two questions. If you are going to dispute the data, you will need to provide a rational, quantitative contrarian analysis, not just some "I want to be pessimistic, so there!" sentence. For example, you said 18 months ago that the housing bubble would bring on a new Great Depression. I said that the housing bubble (which itself I do not dispute), will NOT drag down the broader US economy, let alone the world economy. Who turned out to be right? You need to quantify your pessimism. The housing bust which you just now acknowlege is real. The peak in housing prices was in the summer of 2005. The bust is not over and may yet bring a depression. Over 950,000 houses were foreclosed in the first 6 months of 2007. About 100 subprime lenders have gone out of business. The corrupt financial community has been covering up the decline in mortgage backed bonds. S&P and Moody's downgraded only about 1% of these bonds last week. The ABX derivatives on these have now declined 55% and some hedge funds have gone bust after recognizing Billions in losses because of the downgrading of just 1% of these bonds. House prices declined for about 20 years in Japan and it still has deflation. Be patient, deflation takes time to work its black magic. Most depressions have been deflationary but some inflationary. I need not dabble with your data. I have no knowlege of the the faulty assumptions you used to build the data. Quantifying pessimism is stupid. It reminds me of the math of "average". If you put one hand in boiling water and the other in icy water, then on "average" you are feeling just great. The same "average" is used for "average" rainfall, average family, etc. You may stay in your optimistic view and deny that bad events occur. I love the article. Must take care of body so I can witness this rapid change! The housing bust which you just now acknowlege is real. Wrong. I have been talking about the housing bubble since April 2006, a thread you also commented on. Don't rewrite history. Also, I said it would not cause a recession in the broader economy, and it has not, and it will not. After 15 months, I have been proven right. I have no knowlege of the the faulty assumptions you used to build the data. Then how do you know they are faulty? Failure to provide specifics erodes the credibility your claims. Anyway, all data is from declared, provided sources like the IMF. Come on. I know you are not a Leftist. But this is what those anti-US leftists do in the political debates when they can't debate on facts. I don't want you to become like them. It reminds me of the math of "average". You are entirely avoiding the subject of standard deviations , and what are the probabilities of one datapoint being 1, 2, or 3 standard deviations from the mean. You have to show me that you are taking standard deviations into account, for me to take your subjective pessimism seriously. All bad events, whether the GD, the 1970s, dot-com bust, Asian financial crisis, 2004 Tsunami, etc. are all followed by a recovery that gets the trendline right back to where it would have been without the event. You have yet to provide a single example otherwise. 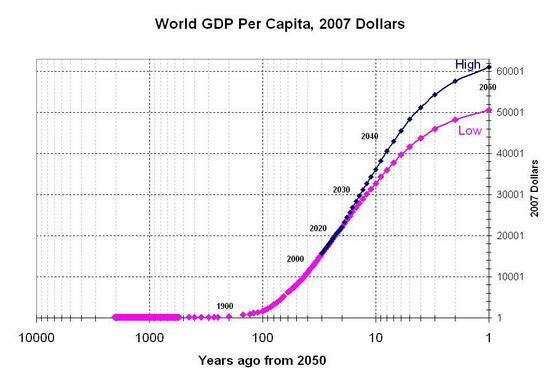 Never in the last 200 years has GDP been below the trendline for more than 6 years. 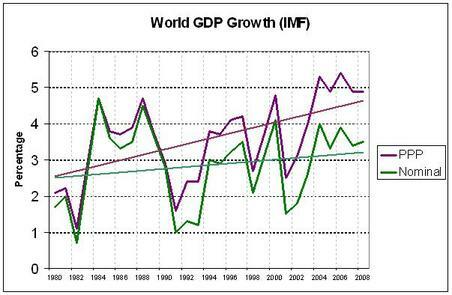 There has been no year of negative GDP growth for the world econony since 1973. I challenge you to prove either of these two statements wrong. "Also, I said it would not cause a recession in the broader economy, and it has not, and it will not. After 15 months, I have been proven right, and you have been proven wrong." "I challenge you to prove either of these two statements wrong." Be patient, the bad times are coming. We'll see. You said that 18 months ago as well. Let us review in another 6 months. In the meantime, always make note of where we are, relative to the trendline. Miami Florida property crash: You may never see something like this again in your lifetime. One of the ugliest housing / property crashes in the history of the US is happening in condo-crazed Miami Florida. As this Bloomberg headline story points out, in the middle of the crash, builders are still building. And there are no buyers. Anyone want to guess the percent downfall from peak to trough? 20%? 30%? 50%? 80%? When the dust settles, this dot-condo flameout will be a crash for the ages. Miami may see the worst fall - yes, even bigger than Vegas or Phoenix. Well done Miami. Well done. July 20 (Bloomberg) -- In the middle of the biggest glut of condominiums in more than 30 years, Miami developers keep on building. The oversupply will force prices down as much as 30 percent, the worst decline since the 1970s, and help push Florida's economy into recession as early as October, said Mark Zandi, chief economist at West Chester, Pennsylvania-based Moody's Economy.com, who owns a home in Vero Beach, Florida. Thirty-seven new high-rise condos and 20,000 new units are being built in Miami's 1,040-acre downtown, where sales fell almost 50 percent in May, according to the Florida Association of Realtors. The new units will join the 22,924 existing condos in Miami-Dade County that were for sale in April, according to Jack McCabe, chief executive officer of McCabe Research & Consulting LLC in Deerfield Beach, Florida. That's the most unsold units since McCabe began tracking sales in 2002. While the housing industry is responsible for 10.6 percent of the nation's jobs, in Florida it accounts for 20 percent, Zandi said. Florida construction jobs fell 2.9 percent in May to 626,200 from the peak in June 2006, according to the U.S. Bureau of Labor Statistics. As much as half of those putting down deposits for Miami condos are speculators looking to flip units, or sell them quickly for a profit without living in them, said McCabe of McCabe Research. With sale prices falling, McCabe said he expects up to 50 percent of them to walk away from their deposits in the next 18 months rather than complete the sales. Many ``flippers'' closed on their units and now can't sell them, said Michael Cannon of Integra Realty Resources-Miami Inc., leaving completed condo towers with floors of dark windows and empty balconies. The skyline of Miami is visible from Key Biscayne, the barrier island where John Rosser lives. Some nights the real estate broker scans the new buildings and sees more dark windows than lighted. What's your point? The Dow reached 14,000 for the first time yesterday, and that is a far broader measure than condos in one city. The housing bubble will not cause a recession in the total US economy, much less the world economy (the subject of this article). You have provided nothing to support the contrary. So let me see if I get this. The effect of the deflating of the housing bubble is to provide lower cost housing for the solvent (the large majority of US citizens) and of course this is bad. Even in a zero sum economy things like the crash of housing prices mean that the losers are helping the winners. And we don't have a zero sum economy. "Thus, in a simple example, if the World GDP growth trendline is currently at 4% a year, there is a 68% chance that the next year will be between 3% and 5%, and there is only a 0.3% chance that the next year will be below 1% or above 7% growth. This means that a worldwide recession with a year of negative growth is extremely improbable, just as improbable as a year with stupendous 8% growth." That's a basic error. The standard deviation is wrt the accuracy of the measured data points. The trend-line is simply a statistical trend over the measured data points, it tells you precisely nothing about what will happen in the future - to apply the standard deviation to predictions about future events is a category error. It's sort of funny to see such an apparently complex debate springing from such a glaring error. How different the world looks in 2012 in the midst of the global economic crisis! The Bubble has burst. I note that the Delong website you refer to has disappeared from the internet entirely. I think this demonstrates the flaws in Neoclassical economics more clearly than any theoretical argument. Not really. 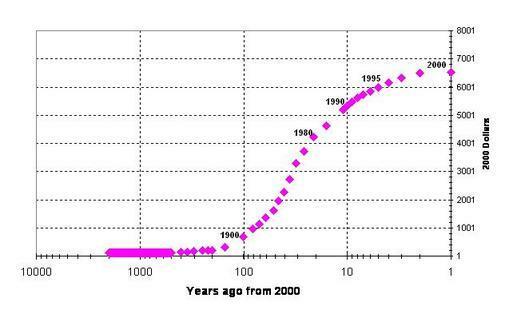 The same exponential growth has continued on a worldwide basis (mostly by China). I look forward to be part of the process - as long as possible. Comparing my grandfathers experiences of change to what is ahead of us, makes it even more exciting. Where should I send the request?